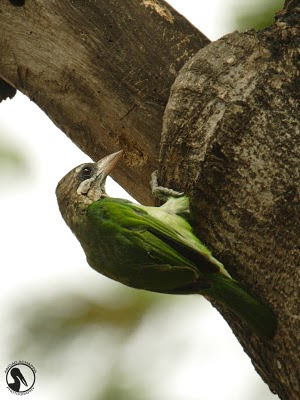 This is one of the many barbets residing around my office. Shot in the morning with a very overcast sky, hence the grainy pic. This one's just for the records. Lens borrowed from my friend Piyush. The problem with a vertical composition on my hawk is that it makes the picture run too deep or too much vertical and people have to scroll down to see it all. A vertical portrait style leaves a lot of white space on one side of the image not filled by anything except the white page. I choose horizontal because that works in the rule of thirds in photography composition and I like it. Having photos cropped down to the image itself works on some subjects but seldom in wildlife photography. I want to please myself in my photos. I opened up the shadows on the face as much as I could without incurring lots of noise in the dark areas of the feathers. So what you see is the best possible even with Photoshop CS5. All of my photos are housed in a museum in Japan and are frequently put on display. Some are used by the Japanese in books about the Occupation in Japan. I began taking professional pictures in 1953 in Japan. Thank you for your visit to my birds blog. Fantastic bird and splendid pictures Angad. THis is a very colorful bird! What a beauty, love that glorious colour~ Have a great day! cool photo, thanks for sharing!